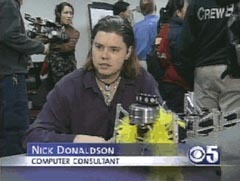 On February 6th, 2002 a camera crew from KPIX, the San Francisco local CBS affiliate station, came to the monthly meeting of the Robotics Society of America. Reporter Sue Kwon interviewed Nick and several other members of the Society, together with BattleBots builders Jim Smentowski and Stephen Felks. The crew videotaped Ziggy walking, avoiding objects and dancing and he got a fair amount of airtime in the finished segment. We all had to wait over a month for the segment to air, but when it did Rick Washburn taped it and edited it together into the very slick video that I present here. Thanks Rick! There are three videos presented here; the first is the teaser trailer shown earlier in the program featuring Ziggy, the second is the full segment as edited by Rick, and the third is just the airtime featuring Ziggy.